The Seattle Mariners will begin a crucial 10-game road trip on Monday with the opener of a three-game series against the surging Texas Rangers at Globe Life Park in Arlington. Seattle will send left-hander Wade LeBlanc (6-2, 3.95 ERA) to the mound and the Rangers will counter with left-hander Martin Perez (2-4, 6.50). The Rangers head into Monday's game after a 9-6 loss to the Baltimore Orioles at home on Sunday that snapped a three-game win streak. Right-hander Drew Hutchison, who agreed to a contract with Texas on Saturday night, lasted only three innings in the setback, which spoiled the Rangers' bid for a four-game series sweep. [post_ads]Hutchison was making his first major league appearance since May 30 with the Philadelphia Phillies and his first start in the majors since Sept. 10, 2016. He gave up six runs and allowed nine of 17 batters to reach base on six hits and three walks. The Rangers were drawn to Hutchison after his stint at Triple-A Oklahoma City in the Los Angeles Dodgers' organization. The Dodgers signed him after he refused outright assignment with the Phillies. Hutchison made two relief appearances at Oklahoma City and then went into the rotation, going 3-0 with a 1.22 ERA in seven starts. He had a 23-inning scoreless streak in his final four starts before taking free agency and signing with the Rangers. "I'm disappointed at the way I pitched (Sunday), but I will move on from it," Hutchison said. "I had poor pitch execution -- poor command and just too many balls up in the zone." The Mariners defeated the Toronto Blue Jays 6-3 on Sunday to avoid being swept and to keep pace with surging Oakland in the race for the second American League wild-card spot. 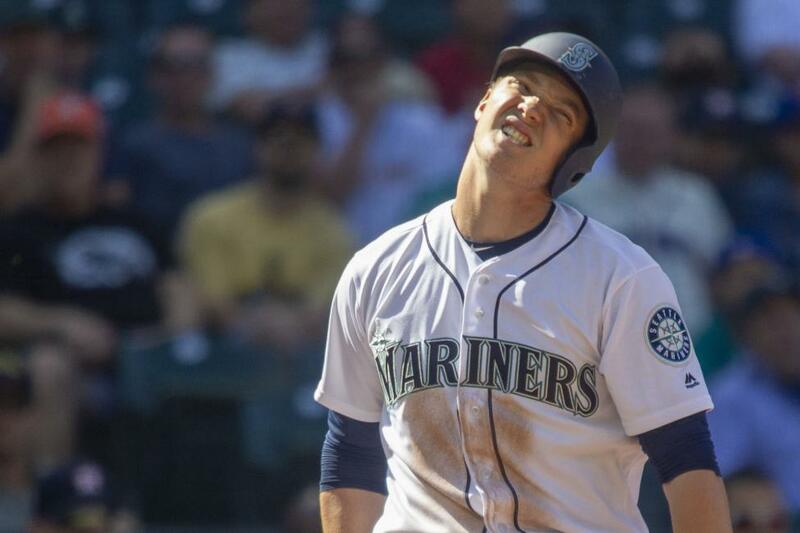 They won thanks to homers from Kyle Seager and Nelson Cruz, the latter of whom had four RBIs. Mike Leake kept the Mariners in the game with 6 2/3 innings of three-run, nine-hit pitching, but he did not get the decision. Closer Edwin Diaz pitched a perfect ninth to pick up his major league-leading 41st save of the season. "It's nice to see a complete game out there from everybody," Seattle manager Scott Servais said. "We had a lot of really good at-bats offensively today, and we had the Seager game today. We've been waiting for that one, and Kyle was huge there." With the victory, the Mariners stayed 2 1/2 games behind Oakland after the A's beat the Detroit Tigers on Sunday. Seattle also snapped a five-game losing streak in which they were outscored 32-11. LeBlanc will make his 18th start of the season. The Mariners are 11-6 in his starts, including an 8-3 loss to Houston on Aug. 1 in his most recent game. He gave up a season-high seven runs in 4 1/3 Innings to the Astros in the loss. His first win of the year came against Texas on May 31. Perez, who was pushed back in the rotation in favor of Hutchison on Sunday, is winless in four starts since coming off the disabled list despite a 3.47 ERA. He allowed two runs in seven innings of a 7-4 win over the Mariners on April 22, and he is 7-4 with a 3.26 ERA in 16 starts and two relief appearances in his career against them.